The Friday Fun & Easy Landscape Challenge 3/16 -3/22: Draw a landscape using the Rabbit step-out. Extra calorie-free brownie points for making him hold something. One of the very first Fun & Easy step-outs that I did was for a quick and easy Bunny. But with Easter coming up, I wanted to create a step-out for a more complex rabbit. Don’t worry though – I know everyone doesn’t celebrate this holiday, so my rabbit can easily be used for other drawings. I gave him a pose that allows him to hold something, whether it’s an Easter Egg, a carrot or something else of interest to you. You know, I remember, way back to my first year in school when I was five, we were told to draw a rabbit. One of the boys in my class drew one that was all square. I laughed at his drawing, and to this day, 60 years later, I regret that. He was daring to be different, and I was the one stuck on the idea there was only one way to draw a rabbit. Hopefully, he wasn’t discouraged and went on to become a great artist, drawing his squared animals. 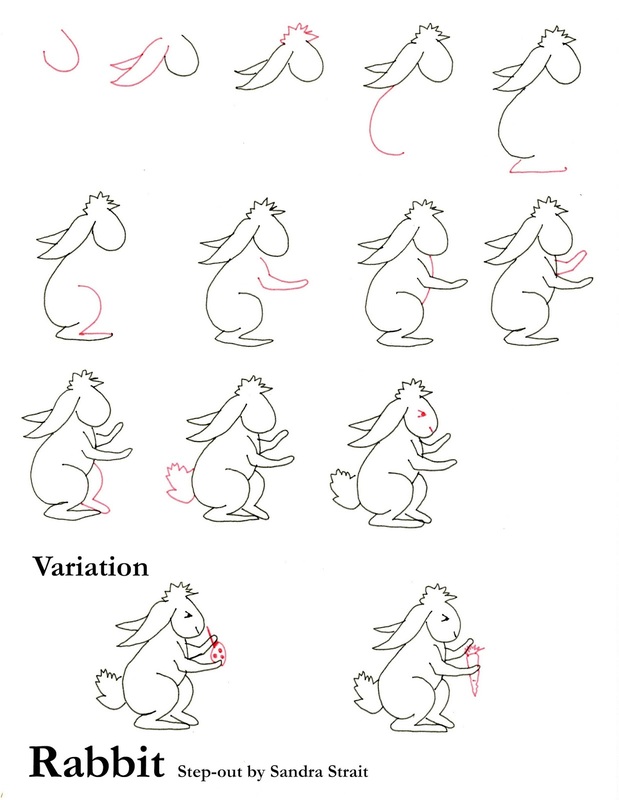 If you find the curves in this rabbit difficult, don’t hesitate to simplify the shapes. Try drawing a square rabbit, or a triangular one. Mix and match the shapes – go crazy and let your unique flag fly! 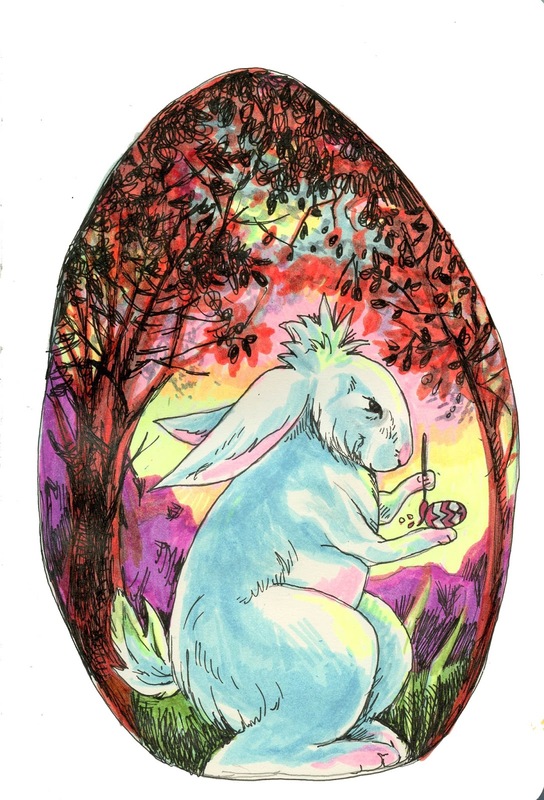 This step-out was drawng with Zebra Pen Fineliners, and the example was drawn with a Zensations Technical Pen, and colored with Mildliner Highlighters in a Mother Leda Medium Art Sketchbook. So which do think came first – the rabbit or the egg?